Let’s do this with one example. So actually to achieve the enable and disable of the Date parameter, we need to have a dummy parameter created which will not be displayed and the same should not be used in the code present in background. 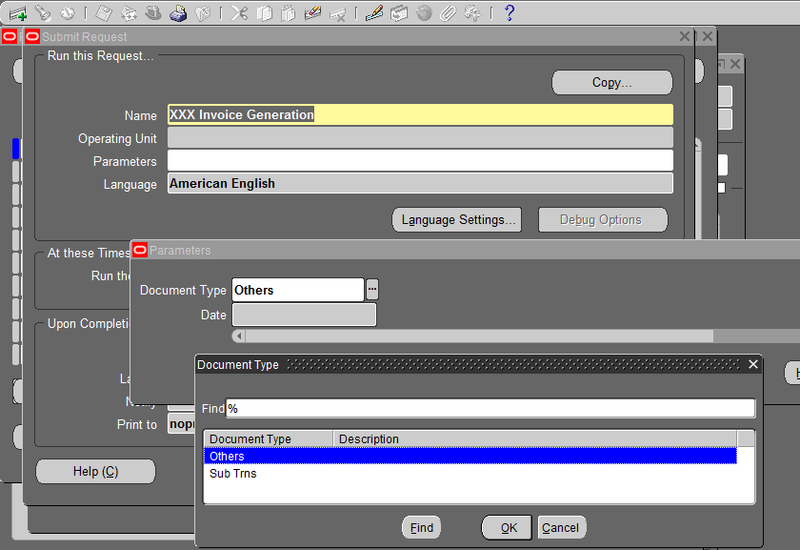 Here in this example the parameter is created as Type and prompt as Document Type which is attached to a value set TEST_TYPE which is of type independent and has the values “Others” and “Sub Trns”. 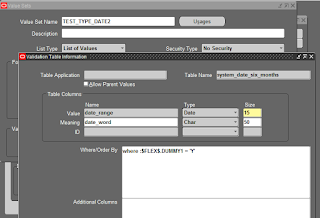 This is the Dummy parameter which is created to control the enabling disabling of the Date parameter. 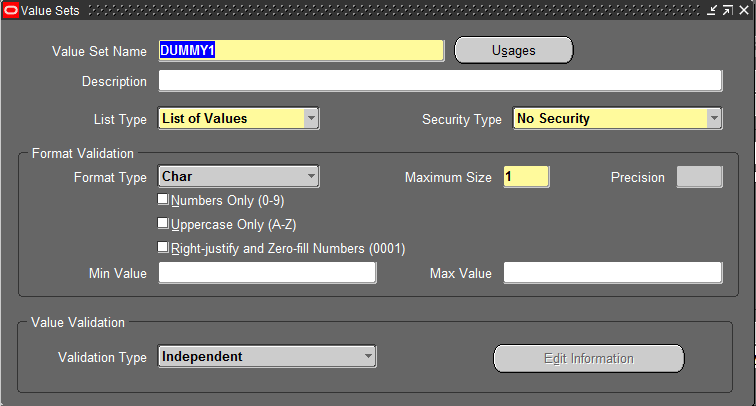 This parameter is attached to a valueset DUMMY1 which is of type independent and has the values “Y”. So to achieve this, we need to use a table type valueset where we need to put the validation for validating with Dummy1 parameter value. 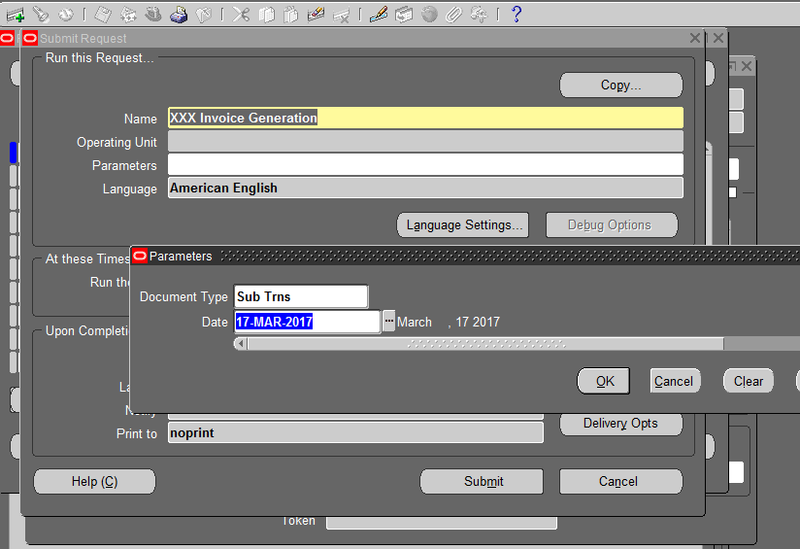 So as per the requirement when Document Type is “Sub Trns”, then Date should be enabled which means when Dummy1 value is Y. 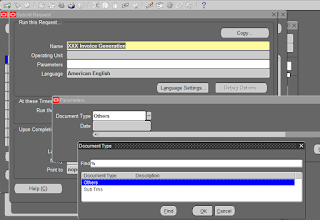 Using above setup enabling and disabling of the Date parameter can be achieved. 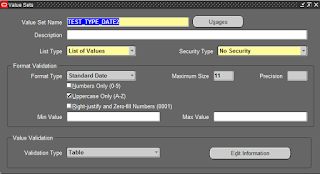 But we have another requirement is to validate the values entered in Date parameter as a valid date or not. Normally this could have been validated using a valueset FND_STANDARD_DATE but that is of Validation Type None and we cannot have the enabling and disabling functionality if we use this. So technically to achieve this, we need to tweek the requirement little bit. We cannot have a plain valueset which will simply validate whether it’s a valid date or not. 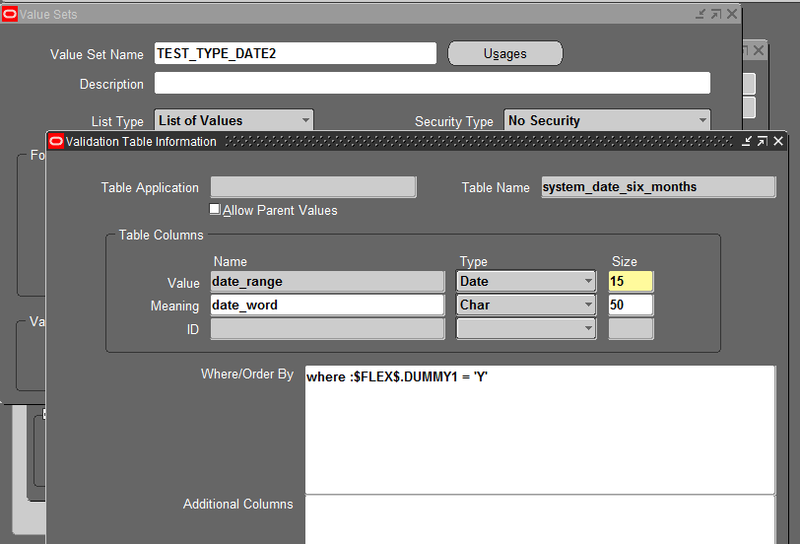 Instead, as we are using a table type valueset to trigger the enabling and siabling of the parameter, we have to create and use a view which will hold dates for certain period like in this example, last 6 months and next 6 months date. And pull the dates from the view in the valueset. So when user enters a date, it will validate with the list of values for date between last and next 6 months and allow to proceed further. Update on achieving the second requirement for validating entered value as a valid date or not in Date parameter. MaxMunus Offer World Class Industry best Consultant on #MANHATTAN #WMS. We provide end to end Remote Support on Projects. MaxMunus is successfully doing remote support for countries like India, USA, UK, Australia, Switzerland, Qatar, Saudi Arabia, Bangladesh, Bahrain, and UAE etc.